This one is another really dead simple tute (and really, how good are they?) 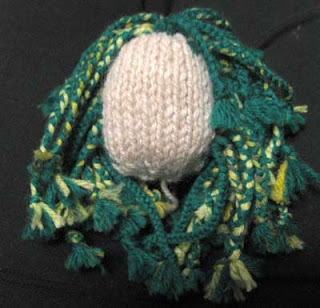 I used it a couple of years ago for the antenna of the robot GIR from Invader Zim, but it’s also worked really well for snakes for a Medusa doll and it’d be great for dreads too. 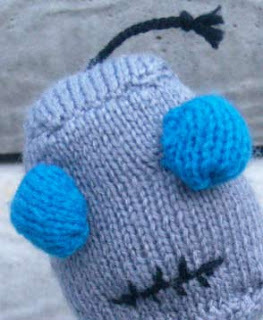 This works best with knitted dolls, however it can work with material dolls as well. Step one:Work out how long and what colour/s you want the dreads/snakes/antenna to be. 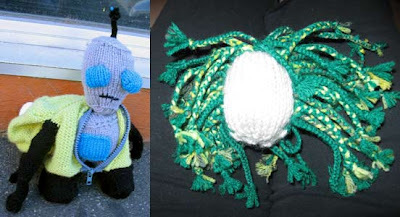 For an antenna you could go gray or black, the snakes are a mix of mainly forest green with alternating light green and a green/yellow patchy yarn. Dreads could be any colour at all you fancy. 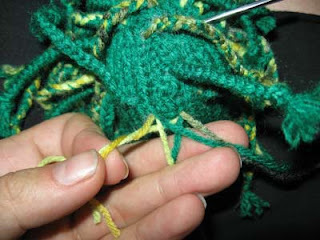 Step two: However long you want the dreads/snakes/antenna to be, cut three strands of yarn double the required length. Using the darning needle, thread these three lengths through the head, ensuring that there is an even amount of yarn on each side. 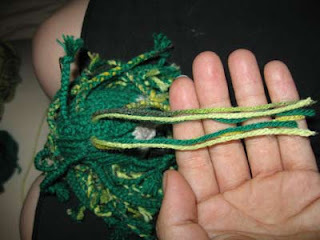 Step three: Divide the yarn into 3 sets of pairs and plait. 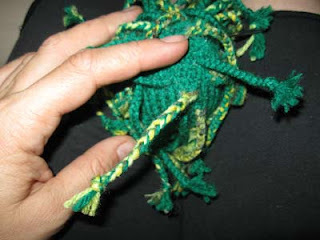 I find it best to gather one strand from each side of the yarn. The more tightly you plait them, especially at the start, the better they will stand upright. Step five: For dreads and snakes, repeat steps two to four. A lot. I’ve found that it’s just by experiment that you work out how many you’ll need. Hold the head away from you every so often to see how many more you’ll need. For antenna, you’ll probably only need one or two.